Once again these are massive DOUBLE-DVD sets – the Olympia Men’s 2 disc set includes Mr. Olympia Prejudging, Mr. Olympia Finals, 212 Showdown and the Olympia Physique competition, plus a bonus of the Men’s Model Search and some Pump Room action from backstage of the men preparing to go out on stage. Pump room footage shot by GMV in a first-ever for a Mr. Olympia DVD. 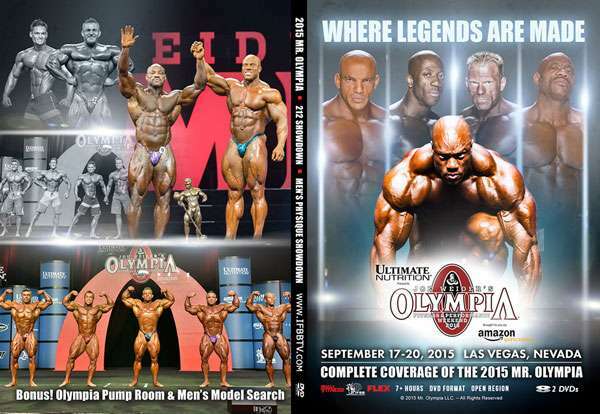 This DVD set contains over SEVEN HOURS of amazing Olympia coverage! The 51st annual Joe Weider’s Olympia Contest took place in Las Vegas | Nevada on September 18-19th | 2015. It was an amazing success. Catch all the action and excitement with this Double-DVD set containing over 7 hours of coverage! The 2015 Olympia Weekend was probably the best, most exciting ever. The video production was in the hands of absolute professionals making these 2 DVD sets an absolute must-have series. 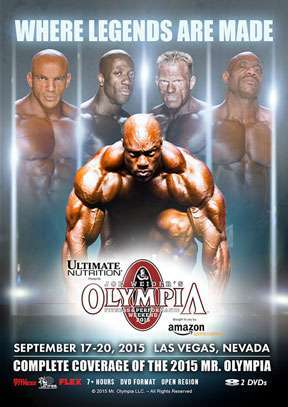 Once again these are massive DOUBLE-DVD sets – the Olympia Men’s 2 disc set includes Mr. Olympia Prejudging, Mr. Olympia Finals, 212 Showdown and the Olympia Physique competition, plus a bonus of the Men’s Model Search and some Pump Room action from backstage of the men preparing to go out on stage. Pump room footage shot by GMV in a first-ever for a Mr. Olympia DVD. This DVD set contains over SEVEN HOURS of amazing Olympia coverage! This would have to rate as the biggest and best Olympia series of DVDs offered to date.